Indra Loka and Deva Loka are the same since Indra is the leader of the Devas who lives in their capital Amravati. The place is mentioned at many places and am sharing some of the references below. 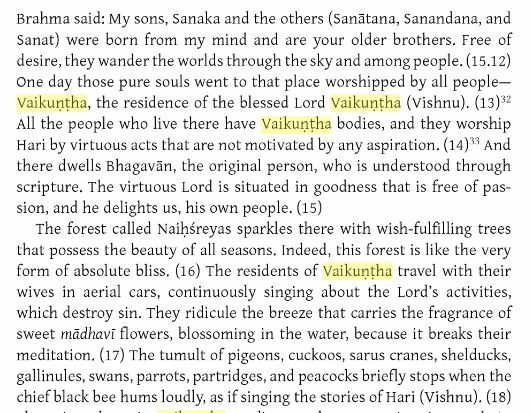 On the other hand, Vaikuntha is the spiritual abode of Lord Vishnu and scriptures give details of it as well. And I saw the regions, moving anywhere at will, and the splendour also of the highly energetic Gandharvas, Apsaras, and the celestial sages. And Sakra's charioteer, Matali, at once showed me Nandana and other gardens and groves belonging to the celestials. Next I beheld Indra's abode, Amaravati, adorned with jewels and trees yielding any sort of fruit that is desired. There the Sun doth not shed heat; nor doth heat or cold or fatigue there affect (one), O king. And, O great monarch, the celestials feel neither sorrow nor poverty of spirit, nor weakness, nor lassitude, O grinder of foes. And, O ruler of men, the celestials and the others have neither anger nor covetousness. And, O king, in the abodes of the celestials, the beings are ever contented. And there the trees ever bear verdant foliage, and fruits, and flowers; and the various lakes are embalmed with the fragrance of lotuses. And there the breeze is cool, and delicious, and fragrant, and pure, and inspiring. And the ground is variegated with all kinds of gems, and adorned with blossoms. And there were seen innumerable beautiful beasts and in the air innumerable rangers of the sky. Then I saw the Vasus, and the Rudras, and the Sadhyas with the Marutas, and the Adityas, and the two Aswins and worshipped them. And they conferred their benison on me, granting me strength and prowess, and energy, and celebrity, and (skill in) arms, and victory in battle. Then, entering that romantic city adored by the Gandharvas and the celestials, with joined hands, I stood before the thousand-eyed lord of the celestials. And after he had become invisible to the mortals of the earth, he beheld thousands of cars of extra-ordinary beauty. And in that region there was no sun or moon or fire to give light, but it blazed in light of its own, generated by virtue of ascetic merit. And those brilliant regions that are seen from the earth in the form of stars, like lamps (in the sky)--so small in consequence of their distance, though very large--were beheld by the son of Pandu, stationed in their respective places, full of beauty and effulgence and blazing with splendour all their own. And there he beheld royal sages crowned with ascetic success, and heroes who had yielded up their lives in battle, and those that had acquired heaven by their ascetic austerities, by hundreds upon hundreds. And there were also Gandharvas, of bodies blazing like the sun, by thousands upon thousands, as also Guhyakas and Rishis and numerous tribes of Apsaras. And beholding those self-effulgent regions, Phalguna became filled with wonder, and made enquiries of Matali. And Matali also gladly replied unto him, saying, 'These, O son of Pritha, are virtuous persons stationed in their respective places. It is these whom thou hast seen, O exalted one, as stars, from the earth.' Then Arjuna saw standing at the gates (Indra's region) the handsome and ever victorious elephant--Airavata--furnished with four tusks, and resembling the mountain of Kailasa with its summits. And coursing along that path of the Siddhas, that foremost of the Kurus and the son of Pandu, sat in beauty like Mandhata--that best of kings. Endued with eyes like lotus leaves, he passed through the region set apart for virtuous kings. And the celebrated Arjuna having thus passed through successive regions of heaven at last beheld Amaravati, the city of Indra." And having beheld those celestial gardens resounding with celestial music, the strong-armed son of Pandu entered the favourite city of Indra. And he beheld there celestial cars by thousands, capable of going everywhere at will, stationed in proper places. And he saw tens of thousands of such cars moving in every direction. 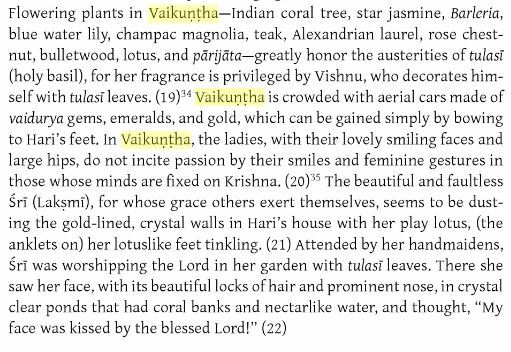 And fanned by pleasant breezes charged with the perfumes of flowers, the son of Pandu was praised by Apsaras and Gandharvas. And the celestials then, accompanied by the Gandharvas and Siddhas and great Rishis, cheerfully reverenced Pritha's son of white deeds. Benedictions were poured upon him, accompanied by the sounds of celestial music. The strong-armed son of Pritha then heard around him the music of conchs and drums. And praised all around, the son of Pritha then went, at the command of Indra, to that large and extensive starry way called by the name of Suravithi. There he met with the Sadhyas, the Viswas, the Marutas, the twin Aswins, the Adityas, the Vasus, the Rudras, the Brahmarshis of the great splendour, and numerous royal sages with Dilipa at their head, and Tumvura and Narada, and that couple of Gandharvas known by the names of Haha and Huhu. And the Kuru prince--that chastiser of foes--having met and duly saluted them, last of all beheld the chief of the celestials--the god of a hundred sacrifices. I hope this has cleared your confusion between the two Lokas. Not the answer you're looking for? Browse other questions tagged mythology lokas cosmology swarga vaikuntha .